“This project is about much more than it looks like!” Mr. Foskolakis says. “It has offered to Sbokos Hotel Group an innovative framework for hotel staff training and guest experiential involvement. Sustainable winegrowing sets for our personnel a new set of thinking about local food, about wine tourism, about native treasures –vine varieties in this case- and mainly about communication with the guests”. Babis Foskolakis is the General manager of Sbokos Hotel Group. He is managing properties with one-of-a-kind ambiance and style. Each Hotel and Resort is designed to enhance a different vacation experience from a world class luxury retreat and a romantic beachfront getaway to a traditional Cretan estate and a memorable family escape. 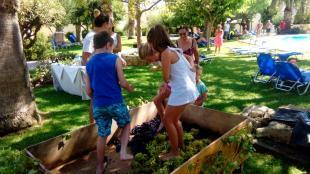 Grape stomping events for kids organized in Cretan Malia Park. An excellent chance for guest awareness about the sustainable winegrowing project. Together with Aris Skyvalakis, the general manager of Cretan Malia Park, they are relaxing at Mouries restaurant of the hotel, enjoying a glass of native Plyto white wine, cooled at the proper temperature, after the successful realization of the 3rd event for the Sustainable Winegrowing project of Futouris. “Wine has been an important part of Greek culture for over 4000 years”, Aris Skyvalakis mentions, “as the numerous archeological discoveries throughout Greece have revealed. 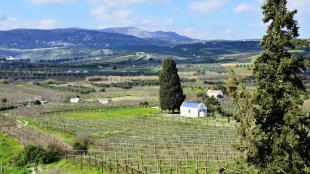 The first traces of wine production in Greece were found on the island of Crete, right next to our hotels. Discoveries of tombs in Crete that date back to 3000-2000 BC portray replicas of winepresses and possibly the oldest winepress in Europe was found in the ruins of Vathypetro near the village of Archanes.”. Mr Skyvalakis adds: “For getting our guests in live contact with native grapes, we organized grape stomping events for the kids. During those events, our animation team gets a chance to transfer historical information and local traditions to the guests”. 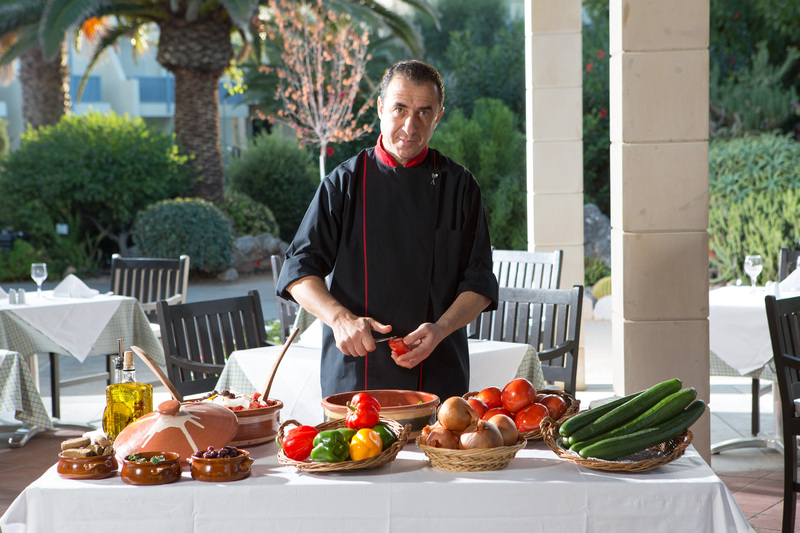 Chef de cuisine, Lefteris Iliadis, joins the small group: “My intention for the first event of August 9,, 2016 was to gently accompany the native wines with delicious traditional Cretan cheeses, Anthotiro and Graviera, performing next to the main pool” the chef says and goes on: “On August 20th, during the second event, I added a little bit more of excitement! We performed that event at the Pergola pool restaurant. Aside to the cheeses our guests had the option to taste traditional Cretan dishes made with grape ingredients: a green salad with grapes and agourida (verjuice; acidic grape juice product of Lyrarakis family, made by pressing unripe grapes), Stuffed vine leaves (dolmades), Grape spoon sweet and Moustalevria (Greek Creamy Grape Juice Pudding)”. Cretan Malia Park Chef de cuisine, Lefteris Iliadis, is a key member of the team for the realization of the winetasting events. 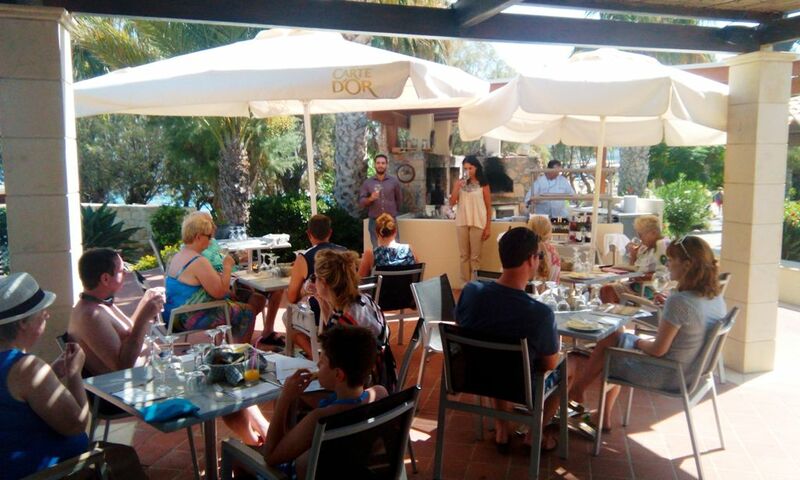 The third Futouris project event took place in Mouries restaurant on September 2, 2016. As in the previous two events, the winetasting guide was the sales manager of Lyrarakis wines and enologist Jannis Epitropakis. The winetasting was held in english and also translated into german by the Guest Relations Manager. The wine events are planned and realized in cooperation with Lyrarakis Wines and Local Food Experts social cooperative enterprise. 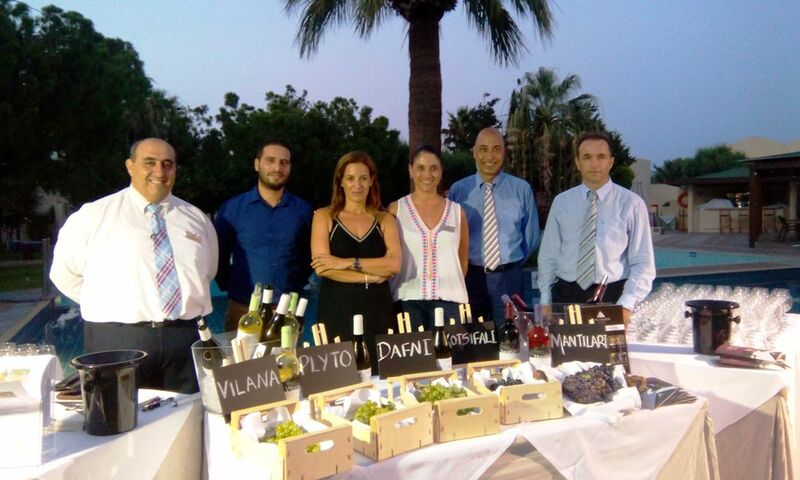 Aris Skyvalakis, General manager Cretan Malia Park (right), Jannis Epitropakis, sales manager of Lyrarakis wines (second from left), Katerina Lyrarakis (third from left), together with leading staff from the guest relation and the F&B department, just before performing the first Futouris project event of “Connecting Sustainable Winegrowing with the Hospitality Services on Crete”. Guests have the opportunity to learn about the Futouris project on Crete, about native Cretan wine varieties and their significance for Cretan terroir, as well as the effort of Lyrarakis family and their affiliated winegrowers to produce grapes and wines by applying sustainability principles, following the goals of Futouris project. Each event “guiding” starts with a video projection about sustainable winegrowing on Crete prepared by Local Food Experts, followed by winetasting and story telling about the history of wine on Crete. The guests taste and smell the aromas and flavours of those special native grapes and wines and listen to the history of each one of them, from the vineyard to their glass. Congradulation to Cretan Malia Park and to the rest of the participating hotels in the project. We wish them everlasting sustainable wineful summers to follow this successful one! Cooking and winetasting event with wines made of native grape varieties. Cretan Malia Park, August – September 2016. Durch die Bewahrung einheimischer Rebsorten und einer engeren Kooperation zwischen Weinbauern und Tourismusbranche soll Kretas Entwicklung als nachhaltiges Weinanbaugebiet und Reiseziel im Mittelmeerraum gefördert werden.